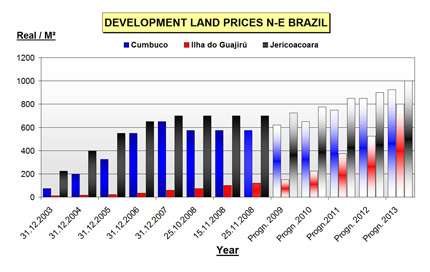 June 2010 - Land prices rising sharply further at Ilha do Guajiru during 2010! 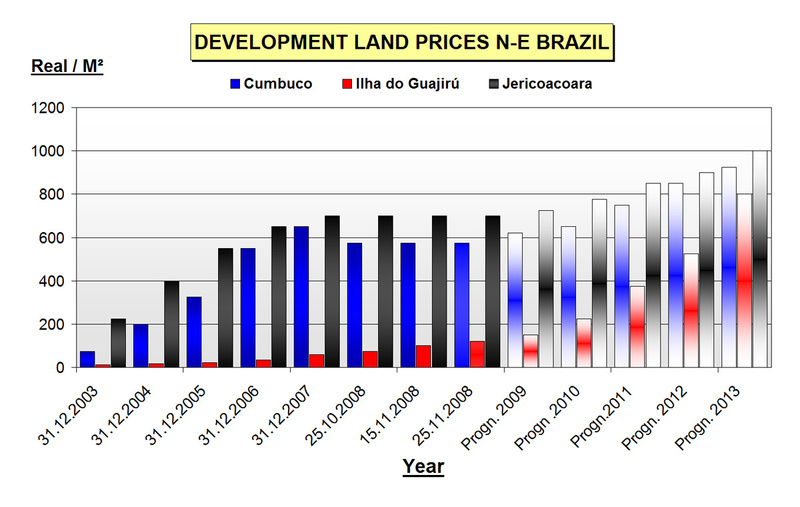 For the 3rd year in a row, land prices at Guajiru are continuing their strong way up due to numerous investments from overseas investors. Due to the island's fast growing popularity, resulting in fully booked pousada's & record visitors for 2010 and a very strong interest of investors to buy real estate at Ilha do Guajiru with only very limited lagoonfront building plots still left for sale! there is clearly no balance anymore between availability and demand at this relatively small, but very popular island. Not known the date of the next increase, anticipated to be somewhere between September and December 2010, the general expectation is prices will rise with 2 digits (2008 +80%!, 2009 +70% !). A more then spectacular score, while a crisis is hitting europe and the U.S. But logical on the other side, if you consider the excellent economical ingredients of Brazil, with millions of barrels oil soon available for export worldwide, eversince april 2008 the world's largest oil field of the past 30 years was discovered before the coast of Rio de Janeiro. So, with it's economy and finance well in order, Brazil is now nominated as the world's best investment spot, with Ilha do Guajiru having absolutely the best ingredients of the entire North East Brazilian Coast line. The set of the trend is amazing, in a world that is talking about a crisis: crisis? What crisis? But also there are various new pousada's being built at the island, but also some new bars and restaurants, 2 kite- and 1 skimboardschool opening during 2010 and also some hotels underway to be build, while the area if officially becoming urban (iso. rural). What else is needed for any experienced investor? For all information on the latest developments on Ilha do Guajiru, Brazil's Ecological Paradise, please see all news items launched at this website or contact Beachlife Real Estate!